Page Titles are the titles that appear in the results of search engine query like “What is in milk?” If you have a page title that uses the keywords “what” and “milk” with a question mark, you have a good chance of popping up in the results. That’s one reason that I love writing my blog posts titles in question format. When I was typing in “Kraft Mac & Cheese”, the Kraft website popped up first with “Kraft Macaroni & Cheese | You Know You Love It”. The page title is highlighted in blue as you can see because it’s the link. There are a few guidelines that the search engines would like you to use when putting in your page titles. Try to keep it between 50-60 characters – or it will be cut off and no one will see those words anyway. Always write for humans but know your important keywords – Be specific about the page they are going to. You don’t have to have “Home” or “Welcome” in the page title for the home page. Put your keywords near the front of the title – The closer your keywords are to the domain, the better. Should your website be in the title (maybe) – if you want to add some branding along with it. If you ever see my page titles, – Don Schindler is usually at the end for branding purposes. Kraft is using their advertising copy to attract their policy. Meta-description serves as your marketing copy when your page is pulled on the search engines. If you look at the image above you’ll see they are using the advertising copy (probably their standard fare) to drive you to the website. Here’s what it looks like in the code. Here’s a few guidelines on how to write up the meta-description for your pages. Try to keep this between 150-160 characters – again it will get cut off if you go over. Write compelling but relevant information about the page that would draw them in for a visit. And definitely don’t lie about the page because the search engines can see the content and it will have a large “bounce rate”. You don’t want that. Avoid duplicating the meta description across multiple pages. – This is a classic mistake that most marketers made in the past. Using the same meta-description will cancel out all meta-descriptions on the pages. Never use quotes. – When a search engine sees a quote, they will cut the rest of the meta-description out. 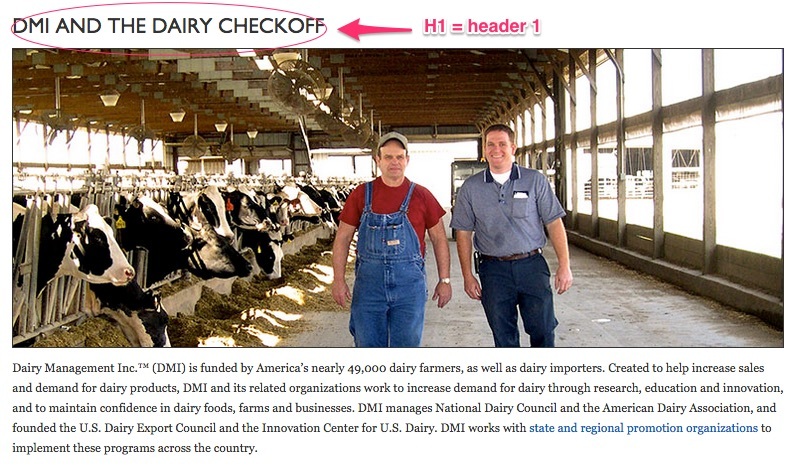 As you can see, DMI and the Dairy Checkoff is the header of the page. Headers should be used to pull in the visitor. In other words, you should be using the H1 tags to put emphasis on the headline you want the reader to read. The search engines are looking to see if the reader stays on the page, reads the headline and looks to click on other parts of the website. Here’s what it looks like in code. You can see it is bracketed h1. If the H1 tag fails and the reader leaves the page, then it will cause a “bounce” increasing your “bounce rate”, which makes the webpage less effective for the keyword in question. The same could be said for “bolding” text on the page. It does give the search engine a bit more emphasis on the words in bold but if the reader leaves then the search engine will lessen the strength of the page even with the bold keywords. Now I’m sure you’ve heard about “Meta-Keywords”. These are not really used anymore by the search engines because of all the SEO spamming so I would recommend that you not worry about putting your keywords on the page. You should know what your keywords are for the web page content – you just don’t have to put them on anymore. What are some of your favorite search engine optimization tips for your pages?